I snapped the photos for this recipe while eating my sad desk lunch. You see, I wasn't all that confident in the recipe when I started making this unusual chowder, and then I had to change up the recipe quite a bit because the turkey I had intended on using in said chowder had a slightly-funky smell (and given that foodborne illness is really not fun, if I have any doubt about the safety of a food item, I err on the side of caution). So I unfortunately had to toss the turkey, and then I had to rejig the recipe using other ingredients I had on hand. Quick life-pro-tip: when you are using a glass container to microwave something, put the lid underneath it, then cover with a paper towel. This way, even though the glass gets SUPER hot, you can still carry the container without burning yourself. I read about this on pinterest a while ago and it has made carrying lunch back to my desk SO MUCH easier. Maybe this was obvious to most people, but my fingertips are ever-so-grateful to be spared. The net result of the random recipe merits a post, even if I don't have a vast collection of beautiful photos to share (and let's face it, I am photo-processing-impaired, so my photos are often lacking a certain something anyway). This is one of those hearty stick-to-your ribs soups, so it's great for winters like this one, which just don't seem to go away. 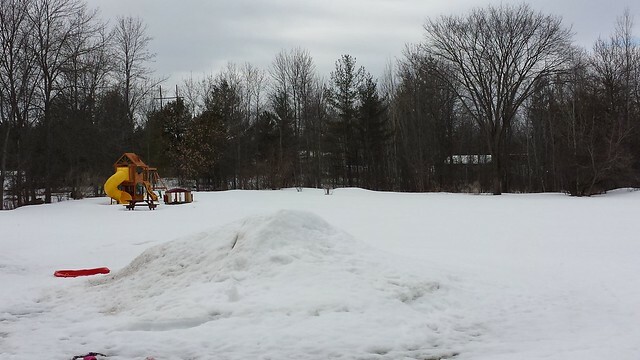 Seriously, it's APRIL and this is my backyard - see how the snow is still up to the windows of the kids' playhouse? UGH. 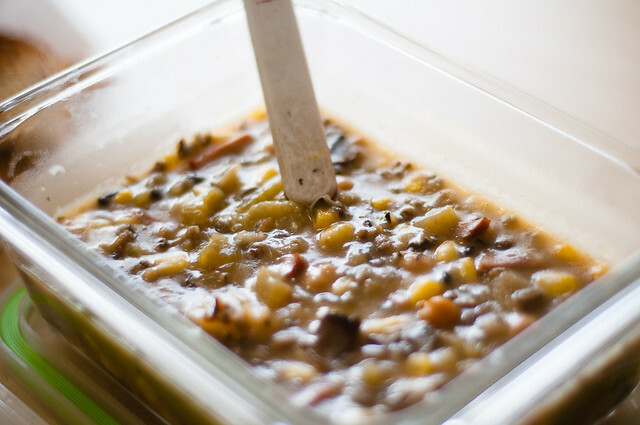 I actually have this chicken in my crockpot for today (smells so good), but I'm feeling so cold and chilled and bleh that I wanted to share a nice thick, hearty chowder recipe with you. But not a fish chowder, or a normal chowder. This chowder is a bit of a random combination of ingredients. But trust me, it's really good. So give it a try! 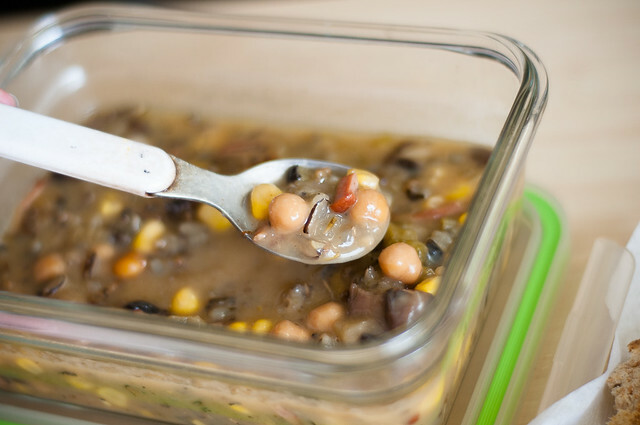 I found that this recipe is a bit more gently-seasoned than many, and it allows the flavour of the ingredients to really come through - the mushrooms, the corn, the rice and the chickpeas. It's mild and just comforting and yummy. 1. Bring 2 1/2 cups water, rice, and 1/4 teaspoon salt to boil in medium saucepan. Reduce heat to low, cover, and simmer until rice is tender but still firm to bite, 45 to 60 minutes (time will vary depending on variety of rice). Drain; set aside. 2. Meanwhile, heat oil in heavy large pot over medium heat. Add mushrooms to pot and cook until beginning to brown, about 8 minutes. Remove the mushrooms from the pot and set them aside. 3. Add butter to same pot. Add celery. Cover; cook until celery begin to soften, stirring often, about 5 minutes. Add shallots; stir until soft, about 2 minutes. Sprinkle flour over and stir 1 minute. Return mushrooms to pot. 4. Add in stock and rosemary; bring to boil, stirring occasionally. Reduce heat to medium-low, partially cover, and simmer 15 minutes. Add rice, ham, chickpeas, and corn to soup. Simmer to blend flavors, about 10 minutes. Stir in cream. Taste and see if it needs a bit more salt/pepper. Garnish with parsley for serving. This is pretty different from your typical chowder, but it uses a lot of pantry staples, so it's a great dish to add into your rotation. This could easily be made vegetarian by simply omitting the ham - you could replace some of the smokiness with a bit of smoked paprika, or you could add in chunks of grilled/bbq tofu if you felt like it. Have any of you ever tried a super random recipe and been pleasantly surprised by the result? I want to hear about it!